Early accounts of fife and drum corps date back to XIII century literary and iconographic sources. 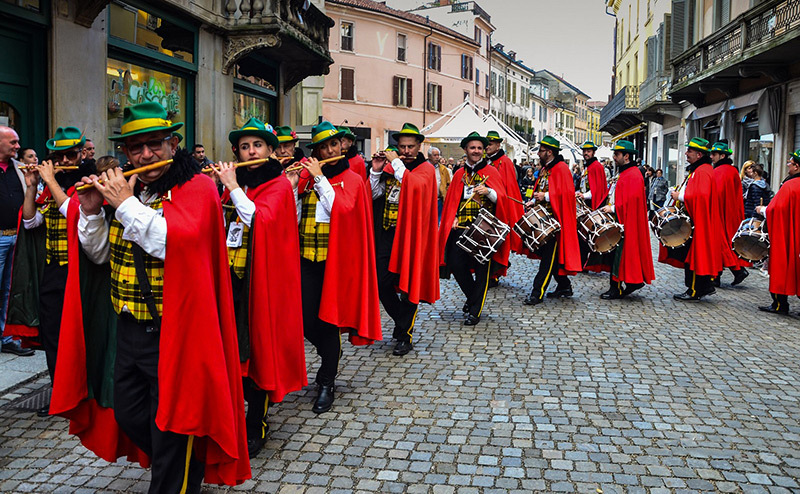 Jesters are displayed playing the two instruments in the open air or in crowded places, like festivals and local fairs, using the loud sound of the ensemble to accompany dances or provide music on the march. 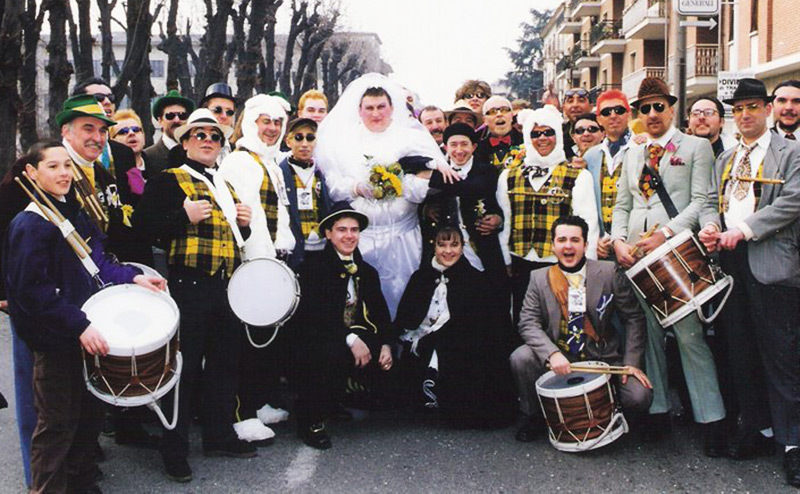 Most likely those figures took part to the first celebration of the Santhià Carnival, the oldest of Piedmont (AD 1328). Over the centuries fife and drum corps were assigned to accompany infantry regiments in various European armies. After the Napoleonic Era, they were gradually dismissed from their military duties as attested in the French Ministerial Order of 19 August 1845 and even in the previous Order issued by the Kingdom of Sardinia in 1831-1832. The first written document about the presence of a fife and drum corps in the Historic Carnival of Santhià is reported in a notice, where, following the list of “Lunch meals on the last Monday of Carnival period”, it is said: “Meals are to be well-done and high-quality otherwise each member shall be taken away of 5 soldi with the exception of fifers and drummers” Date: Santià, 30 January 1833. Among other documents are posters with the program of the Carnival celebrations in 1882 including this note: “Monday 4am, wake-up call with fifers and drummers”. Since then, traditions have passed down from father to son to the present day. The current unit, renewed by a young generation of fifers and drummers in 1970, is nothing but the natural successors to jesters who used to cheer up, entertain and ease people’s everyday problems. The goliardic and convivial spirit of the current members is well depicted by the motto “The fewer we are, the more we eat”. Moreover, an extra uniform was introduced in 1996 to allow the corps attend historical reconstructions. Dating back to the Napoleonic Era, this is an accurate copy of the uniform worn by the “TIRAILLEURS DU PO”, a rifle battalion founded in 1803 in Piedmont, which recruited one third of its soldiers from the Sesia Department. 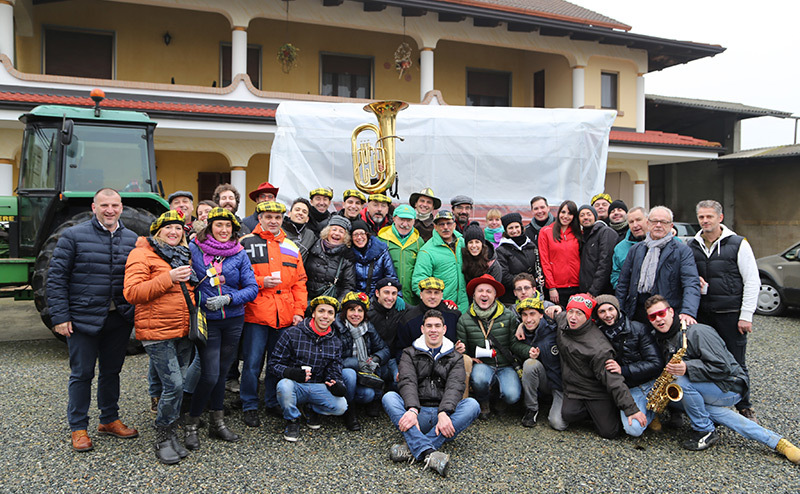 The Fife and Drum Corps is devoted to promote historical and cultural traditions of the Historic Carnival of Santhià. This website is meant to be a source and give voice to the folklore of our territory: LONG LIVE THE CARVE’ AD SANTHIA’! 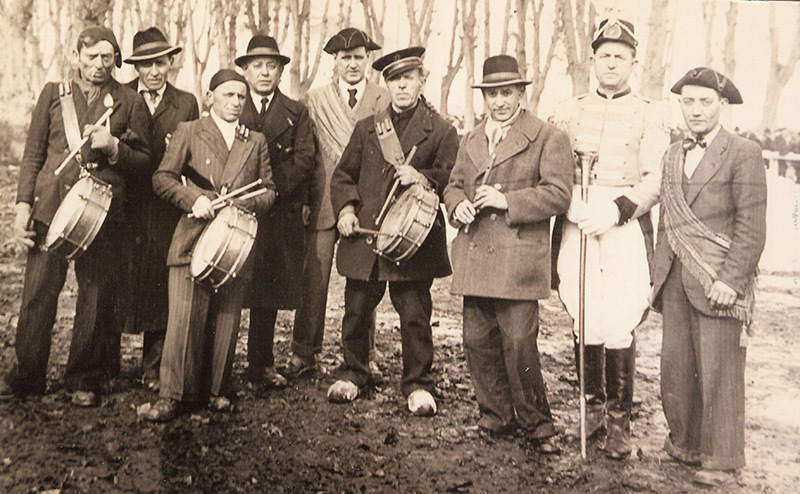 The birth of the Fife and Drum Corps of Santhià in pictures. Pictures of the Fife and Drum Corps in traditional uniform. Pictures of the Fife and Drum Corps in summer uniform. 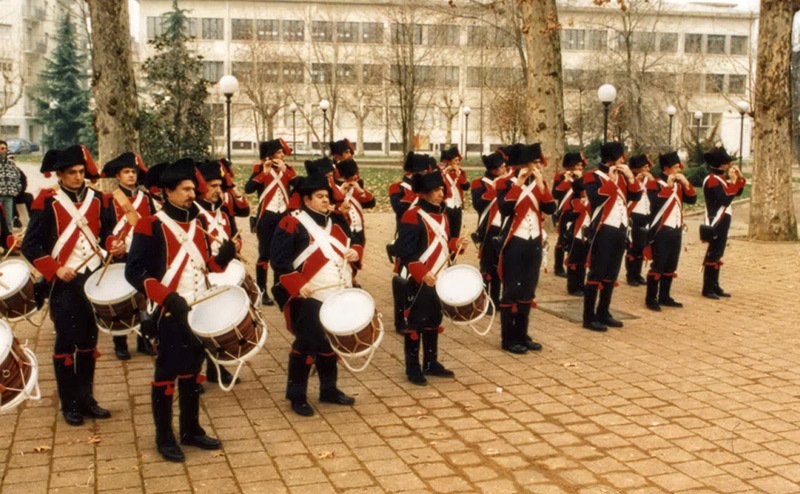 Pictures of the Fife and Drum Corps of Santhià in Napoleonic costumes. Pictures of Carnival happy moments, parades and pule (traditional tours in the Santhià area which held every weekend from 6th January until the Carnival opening to collect offerings for the event). The Carnival parade in pictures. In loving memory of TERESIO BERRI, reformer, mentor and inspiring member of the group since 1970. 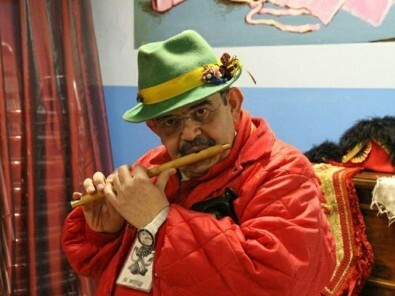 Unique figure of the Carnival of Santhià. you were a friend and a confidant for all of us. You’ll always be our mentor. !!! Our new CD is out !!! "a href="/dicono-di-noi/">Click her to leave a comment"
Vi scrivo dalla provincia di Mantova, sono stato per la prima volta a Santhià in occasione del carnevale con la mia compagna originaria di questo paese e, anche se questo è stato guastato dalla pioggia, sono stato rapito dal calore ed atmosfera di tutti e in particolare sono stato letteralmente rapito dal corpo pifferi e tamburi, siete fantastici e spero di potervi rivedere ed ascoltare presto… Ciao Santhià! 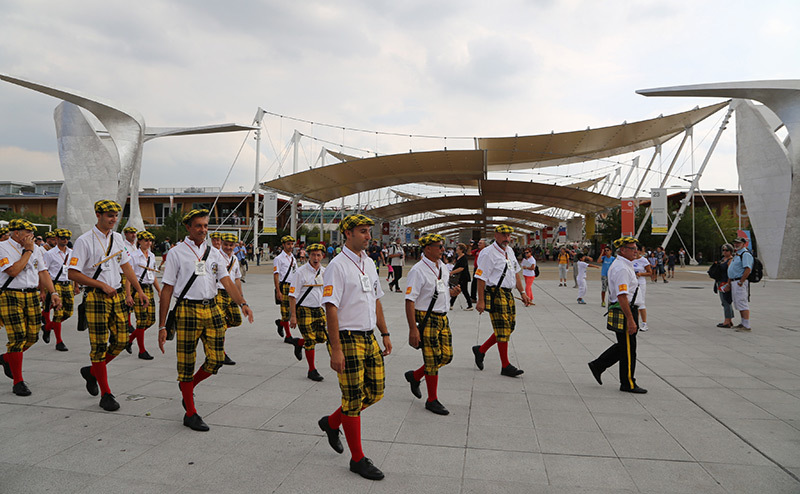 With the network publishing of the renewed site, The Body Pipes and Drums of Santhia City expresses heartfelt thanks, for their efforts in the management of the previous web page at Piper CATTANEO Pier Giovanni. PERU THANKS ! !